Ideal for companies that need an affordable multi-head resaw, the HR500 can grow with your business. From one to six heads, the HR500’s modular design allows you to add more saw heads later, and produce up to six boards and one slab in one pass. For short cants less than 1.2m long or material with internal tension, a steel double roller option is available. A separate control stand holds all controls for the resaw. Blade lubrication and hydraulic blade tension are centrally located to increase productivity and ease of access. Standard, the resaw heads are adjusted with a manual screw. Setworks with electric up/down can be added optionally to boost productivity. The saw heads tilt from 0°-8° to produce tapered siding products. These features allow the HR500 to produce not only pallet boards – its most popular use – but also siding, flooring, fencing, and more. For returning unfinished cants back through the resaw, roller tables are available for a manual cant return system. The base HR500 module includes two heads as standard. 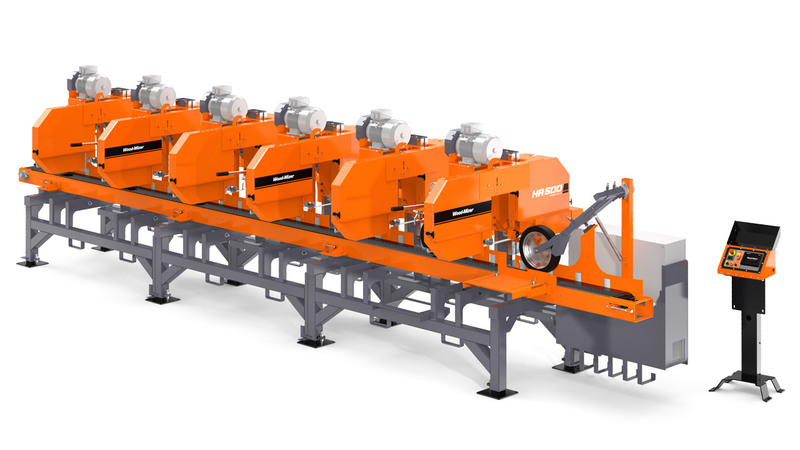 To extend the resaw, all that is needed is to add another two-head module and install a longer conveyor belt. The modular design makes transportation easier and less costly, as well as giving businesses the option to scale up their resaw capability. Start with the 2-head base and extend with one or two additional modules anytime in the future. More durable than rubber belts for long term use. Produce varied angled final products easily with the tilting heads. Each module has centralised blade tension and lubrication for both heads. Increase operator productivity with the optional electronic setworks and electric up/down. The additional rollers provides the stability to handle shorter cants less than 1.2m long.